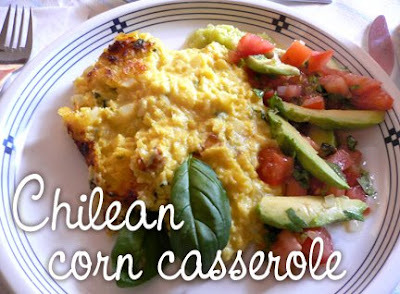 A traditional Chilean dish, this "Pastél de Choclo" is a family favourite. Here is my mother's vegetarian version, which omits the usual beef and chicken. Make lots, you'll want seconds! In a large pot, fry the onion in the shortening and butter until soft. Add the blended corn and cook over medium heat, stirring constantly to avoid sticking. Cook for at least 30 minutes, until fully cooked. Stir in basil and salt and cook 10 more minutes. In a small bowl, combine the eggs and milk then stir into the corn mixture. Immediately remove from the heat and mix well. Empty the corn mixture into a large casserole dish or deep earthen dish (must be oven proof) and dust the top with sugar, about 2 tablespoons. Place in the oven at 350F for about 15 minutes until the edges start to bubble. Change the heat to broil and cook just long enough to brown the top, about 5 minutes. Check to make sure it doesn't burn. Remove from oven and allow to cool slightly, about 5 to 10 minutes. Serve with a plate of sliced tomatoes with minced onion and cilantro, seasoned with olive oil and salt. Serves 4. Hi there...did you really mean that the recipe uses 5 kg of corn? This amount barely fits in the pot and seems like it would serve much more that 4 people. Did you mean 5 pounds? Thanks!! Thanks for catching that, fidlerflute! It is indeed 5 bags of 1 pound each, not 1 kilo. I've corrected that in the recipe! Hi Claudia, Your recipes are just amazing.They seem very very contemporary and modern yet with the "local" taste preserved.I am 25 and I guess your recipes are a great treat for all of us at home. Smacky and very healthy.Plus,your descriptions on the three doshas for each recipe is helpful.It has broadened my reading towards Ayurveda and I'm lovong it ! I love your blog and the recipes! A friend (Argentum Vulgaris) sent me here ... and I'm so glad he did. I'm going to follow you and add you to my blog roll. I need to make this recipe to feed 40 people. I noticed that your recipe calls for 5 pounds of corn and only 2 eggs. Are those calculations correct for feeding 4 people? I can't imagine someone eating more than 1 pound. I've tried to research other recipes and it seems the few I've found use drastically different amounts of egg and corn. Please help! Thanks for the great comments, Traveller and Small Footprints! As for making this recipe for larger groups, my mother (who gave me this recipe) recommends just doubling the recipe for one large casserole dish, and then doing that 5 times, so you get 5 large casserole dishes that serve 8 people each (=40 servings). That way the corn gets ground evenly and the contents get cooked consistently with the appropriate number of eggs in each. Hope this helps! I am writing to share with you and your readers a wonderful Ayurvedic resource. We have free educational videos, learning tools, and articles that you and your readers might be interested in. I did not know where I should write this so I decided to do it in the comments section. I hope that is okay. Here is the link. Thank you for your time. It is a grt recipe but i have also read that eggs and milk are incompatable athough it is commonly used.I guess its a grt recipe but not an Ayurvedic recipe. Can you give details on how to make this with the meat it traditionally has? Thx! The original non-vegetarian version consisted of frying onions in lard, then adding lean ground beef plus spices such as salt, pepper, cumin and paprika. Stir in a handful of whole, pitted black olives. There should be enough beef mixture to cover the bottom of the casserole dish by one to two inches. 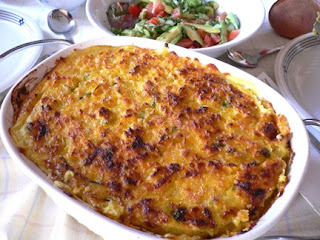 On top of the beef layer, arrange pieces of cooked chicken (quantity to taste), then top with the corn casserole mixture. Then bake as directed! This sounds delicious! In Gujarat, India, most people are vegetarian. We have a version of this that you might find more ayurvedic. Fresh corn kernels tempered with mustard and cumin seeds, cooked in milk/coconut milk, and water, and seasoned with salt, a bit of sugar, lemon juice, cilantro, and fresh chile de arbol or serrano. We use fresh corn so it's a seasonal dish but you could use frozen - just thaw and lightly process in a food processor to break up the whole kernels. Doing this releases the "milk" of the corn that adds to the flavour and gives the dish a lovely risotto-ish texture.